ID: 205 ~ Source: Lamkin, Virginia. “Louisiana's Female Killer.” Seeks Ghosts, 3 Jan. 2014, seeksghosts.blogspot.com/2014/01/louisianas-female-killer.html. 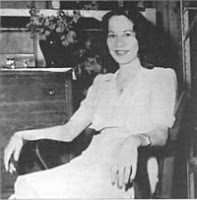 Here is a photo of Annie Beatrice McQuiston, more famously known as Toni Jo Henry. She is the only woman in Louisiana to be sentenced to death in the electric chair. This is her right before her execution.